Roasted Asparagus with Parmesan is an easy spring side dish. Bonus: roasting asparagus and tossing it with cheese makes it a much better partner for wine! Preheat oven to 400. In a baking dish, toss the asparagus with the olive oil. Sprinkle the garlic powder, salt and pepper to taste and half of the Parmesan cheese over the asparagus. Place the baking dish in the oven. Roast for 15 to 20 minutes until the asparagus is tender and beginning to brown. Check after 15 minutes to avoid over cooking. Cooking time will vary based on the thickness of the asparagus, at least 20 minutes is likely needed unless the asparagus is quite thin. Scoop the asparagus into a serving bowl, and toss with the remaining Parmesan. Serve and enjoy! This makes a modest amount of asparagus. 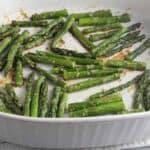 You can easily double this recipe, but you will want to use to baking dishes in order to keep the asparagus in a single layer. To determine where to chop the asparagus to discard the woody stem, hold a stock of asparagus at each end, and snap it in two. The portion opposite from the tip is the woody part you don’t want to cook. It can be reserved for making vegetable broth. Do this with a couple of spears and use the good part from that process to measure where to cut the rest of the asparagus.